We've used this with great success on a Windows 7 computer, installing as a 'generic' Bluetooth device, but we expect it to work just fine with any modern computer as this chipset is very common. So far we've tested it to communicate with Bluetooth data modules only. We've gotten some reports that these modules share a small pool of MAC addresses, so you may get some with the same MAC. That means you cannot use two of them in the same room/computer or they'll collide the RF data. For most people, you only need one per computer. 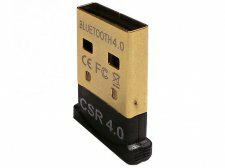 Drivers for CSR Bluetooth modules are built into Windows XP/7/8 so you do not need to install any software or download anything: other bluetooth drivers or 'stacks' such as BlueSoleil are not as good as the Windows stack and will cause problems. Just plug it in and let windows auto-install the BT driver! For Linux, use Bluez which works great, Raspberry Pi tutorial will be similar to your favorite distro. Max Dimensions: 18.66mm / 0.73" x 22.67mm / 0.89"